Got a problem with your car’s electrical system?  Need a new battery? As more and more technology is put into our motors, the vehicle’s electrical system becomes ever more important. If your lights seem dimmer than normal? Got a problem with your car battery or starter? Bring your car to Country Club Garage in Wallingford, CT.
For more than 40 years we have been repairing and maintaining vehicles with our quality auto electrical services. Our highly skilled team have the equipment and expertise to handle your electrical fault in a timely, affordable manner. You can rely on our many years experience in top quality auto repair at affordable prices. The alternator is what helps to power your battery when you use your car. If you have a faulty alternator, you can’t keep charging your battery, so it will eventually run flat! We can accurately diagnose and repair your alternator problem and get your vehicle working at its best again! If you have a problem starting your engine you could have a problem with your starter motor. You don’t want to be stuck somewhere with an engine that won’t start! Bring your vehicle to Country Club Garage for a diagnosis as soon as you notice a problem! Over time the car battery will deteriorate and may need repairing or replacing. Among others, the battery powers the cars ignition system, lights and starter motor. If you have problem with dimming lights for example, it could be caused by a fault in your battery. When you have a problem with your car’s battery, we can help to determine the severity of the issue and advise appropriate action. 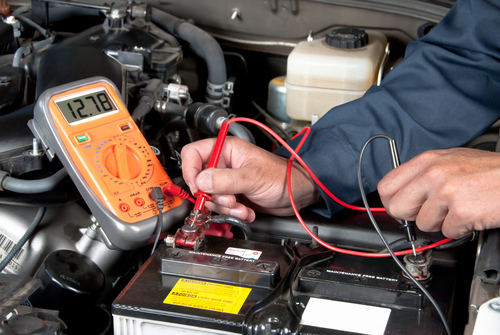 We can diagnose, charge, install and replace your car battery. Our mechanics are skilled in diagnosing your electrical fault, whether you have wiring problems, or problem starting your motor. We will advise on what needs doing and never charge for unnecessary work! The price we quote is the price you pay! Call us for an auto electrical repair today! Do you have a faulty battery, starter or alternator? Call our team for a repair at our Wallingford garage, CT.